It is always a joy for The Legal Genealogist — indeed, for any genealogist — to come across a record we didn’t know existed. I do declare that Elizabeth … now living in my family, daughter of William … & of Rachel …, is born the Eight of October in the Year Eighteen Hundred and five. Now, anyone who does New Jersey research knows that there aren’t any New Jersey birth records before 1848. Except for the ones I learned about for the first time last night. I had the pleasure of speaking at the New Jersey State Archives last night as part of the 2014 Exploring Your Jersey Roots lecture series, co-sponsored by the Archives, Genealogical Society of New Jersey (GSNJ), and Central Jersey Genealogy Club (CJGC). It’s part of the celebration of New Jersey’s 350th birthday. And before I spoke, about researching our female ancestors, I got a personal introduction to some of the holdings of the Archives from the archivists on duty, with a promise for more when I return next week to talk about DNA. That’s how I learned about these birth records. And they are stunning. Not just because they exist, though that by itself is enough of a cause for joy. But because, that record — the way I transcribed it above? That’s not all it says. That’s right: that very earliest set of New Jersey birth records are the children of New Jersey slaves, born into freedom, under New Jersey law. These required birth records for one New Jersey county — Hunterdon County — have been digitized and are available online here. 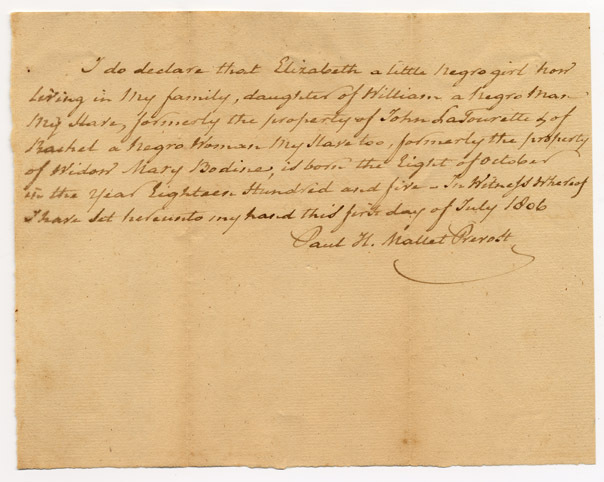 Not all of them are as complete as Paul H. Mallet-Prevost’s declaration of Elizabeth’s birth. Only a handful of the digitized set list the father; some don’t even name the mother, although most do. Some add the township or city where the child was born. Wonderful records. Of a time and a people and a condition of slavery in the North that we often never knew about. I’ve seen these in one county in Pennsylvania where I have read a few years’ worth of court entries in this same time period. I have thought it would be a great project to extract those for greater public accessibility. But then there are always a jillion worthy projects waiting to be done. Time, time, time. It’s becoming the dirty four-letter word of our lives, isn’t it? Trying to get time to do everything we want to do! Great to discover these records!! And, WOW, $5 was a hefty fine in 1805—and then another $ for each month of delinquency–a real penalty for most people!! Sure makes it a lot more likely that the law was followed, doesn’t it? Yes, I think we need to thank that part of the law for having these early records recorded so we can have them today! Wow! These records are incredible. What a find. To have a registered government document stating the full date of birth for a person of colour at that early time period in US history is amazing. Thanks for sharing, Judy. They really are wonderful, aren’t they? Just stunning. These records exist in all of the states that issued “gradual emancipation” laws, most notably New York, New Jersey, and Pennsylvania. Also see the James W. Petty, “Black Slavery Emancipation Research in the Northern States,” National Genealogical Society Quarterly 100 (2012): 293-304. Nice to know they exist elsewhere, but better to have some of them online! And, for lurkers, Connecticut and Rhode Island also had gradual emancipation laws.